Gah, sorry! The days have been running away with me lately. Or I haven’t felt very inspired to write. Or I’ve had too much else to do. Or I’ve spent too much time down the pub. Whatever it is, this blog hasn’t been updated with its usual regularity this past week and a half. For that I apologise. The Greystones here in Sheffield (pictured below) is being held up nationally as embodying a new model by which Britain’s pubs can be saved. 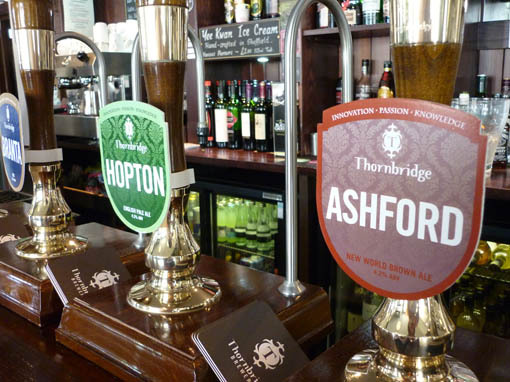 The pubcos’ vast estates and economies of scale are allied with the small independent breweries’ excellent cask beer and closeness to local communities. The Greystones is also an immense pain in the arse to get to from the bit of Sheffield I live in. So when I roll in on Monday 25 April, several month after the pub reopened, I’m a little ashamed to admit it’s the first time I’ve been in. The pub slowly fills up, on this hot bank holiday afternoon, and I neck a couple of pints and a sandwich while I natter to the woman working the bar and wait for my girlfriend and son to come in. It’s a good place to be, an easy place to just be. I’ll write it up as a featured pub if I ever get the time. On Friday it’s another bank holiday, to make us grateful that we’re all paying for the wedding of a couple more idle rich parasites who’d gladly have our hides for doormats. Sheffield’s Rutland Arms (featured here) has promised specifically to be a bunting-free zone, and that’s good enough for me. And Dan and Cara. Eventually it’s over to the Harley for some bands. I’m not sure how much longer I can keep going to the Harley to see bands, because every time I do, the bands look another year younger and I feel another five years older. The following Monday, blow me down if it isn’t another bank holiday. 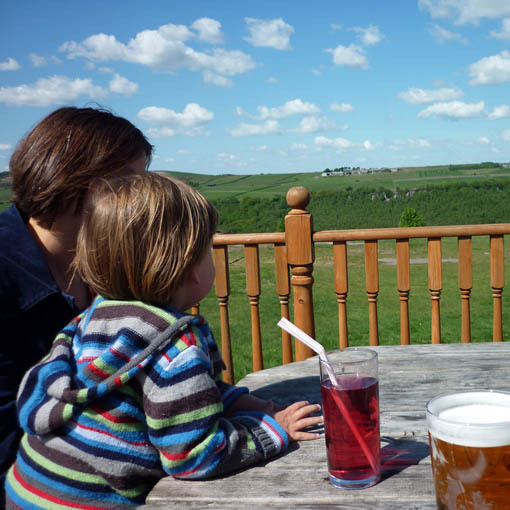 My girlfriend and son and I are on our way back home from a little wander around Hathersage and Surprise View (which is where you go if you want a bit of Peak District without really leaving Sheffield) when I get a text inviting us to a pub called the Three Merry Lads. I’ve never heard of it. But it’s sort of on the way home, so what the hell. The Three Merry Lads, it turns out, is one of those big, lonely pubs that sit in Sheffield’s well-to-do, semi-rural western suburbs. Inside it has the expansiveness of a posh Sunday dinner pub, but without that intimidating brightness about the decor, so it retains a little of itself amid the generous portions of pensions passing over the bar. Outside it’s a bit special: a rolling green garden reaches out to the pretty hills and plunges giddily into the Rivelin valley. We gather in some pints and perch with our friends to watch our children tumble up and down climbing frames. The staff are having a hard time. Either there aren’t enough of them or some terrible mishap has occurred in the kitchen. Whatever it is, they’re becoming almightily flustered as they juggle food orders in a pub that isn’t even busy. To their credit, they keep a cheerful face turned up to the drinkers. But soon a sign goes up saying there’ll be nothing else coming out of the kitchen for an hour. This is no use at all to Vinnie and Dan R, who are aching for lunch. So at length we slope back towards town and pitch up at the Plough in Crosspool. I’ve been to the Plough once before, a few years back, when I came to watch a match just across the road. This was at Sandygate, the oldest football ground in the world, opened in 1804 and host to the kicking game since 1860, when Hallam FC moved in. Today Hallam and Sheffield FC, the world’s two oldest clubs, are playing a friendly to commemorate the 150th anniversary of their first meeting. We arrive just after three o’clock, to the background sound of Sandygate’s crowd and a referee’s whistle. The Plough has the exhaling feel of a pub that has recently emptied out. The decor feels a little austere for a hot day, and with Bradfield’s Farmer’s Blonde off, there’s only Ossett’s Big Red and chewy, horrible Hobgoblin to slake a poor boy’s increasingly pale ale-driven thirst. Vinnie and Dan R disappear again, as the menu is all Big Food. But the service is friendly and the afternoon slow, and the rest of us pass a passable hour and a half here. On Thursday night there’s a quick jar back at the Rutland Arms after my band practice, and then on Saturday there are quite a few jars around the event we’re practising for. It’s an all-day gig in Brixton, south London – or, in fact, it’s the first day of an all-weekend gig. 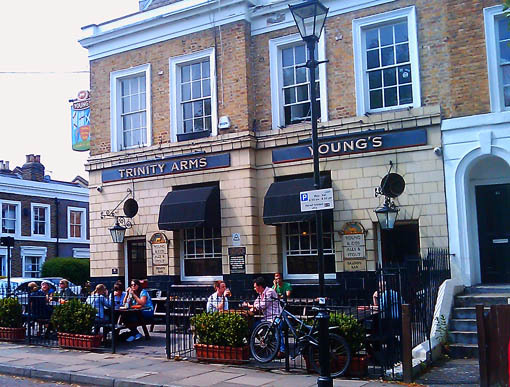 My whistle is whetted with Dan and Marianthi at the Trinity Arms (pictured below), a beautiful little oasis of serenity just two minutes’ walk from the commotion of Brixton’s main drag. You can have any draught ale you like as long as it’s Young’s, but there are three to choose from, and London Gold is just the job. The pub’s distinctly gothic website couldn’t be more incongruous today, as the three of us nestle on a bench outside, watching the cats and sipping lazily in the sun. If only there were something decent to drink at the Windmill. I’ve seen some fabulous gigs here down the years and today I’m excited to be playing here for the first time. But the Pedigree has bits floating in it, and all the clarity of a Dickensian smog. It’s a new barrel but it’s not getting any better. The barman gladly does everything he can, but when the barrel is changed the beer remains bad. This is all marginalia, though, beside the acts on the stage. The delight of great showings from The Wendy Darlings and Ace Bushy Striptease is just about matched by the thrill of a good performance from my band, and that adds up to a champion popshow in my book. I drink Kronenbourg, which goes like water down an ale drinker’s throat, so the delight and thrill of a champion popshow are accompanied by just a bit more intoxication than is probably sensible. This fortnight in pubs ends in slightly odd circumstances the following day, back here in Sheffield. It’s another family afternoon, and on the way home from B&Q (as if we couldn’t quite move on from all those bank holidays and their associations of DIY) we call in at the Florist (pictured below). 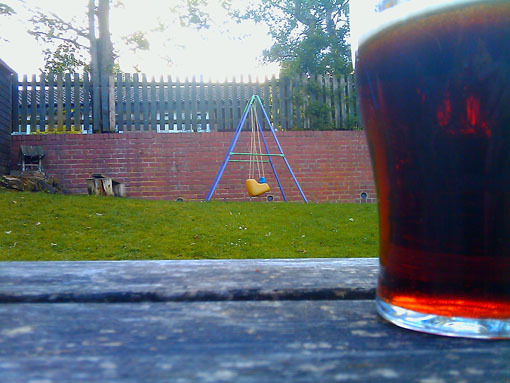 Not because the beer or the company are outstanding – although today the Magnet is half decent – but because we’ve seen a sign saying there’s a children’s play area out the back. And indeed, it’s so much of a children’s play area that we’re the only adults there. My girlfriend and I sit awkwardly, clutching our glasses and supervising our reticent two-year-old while bigger, cheekier children swoop and swirl, left to their own energetic devices by their own mums and dads. Like many another parent, I don’t mind kids at all: it’s just other people’s kids that are sometimes a bit of an issue.